Grains are seeds of grasses. More particularly, the term "grains" usually refers to the cereal grains, those that are used as food or fodder by humans. Three grains—rice, wheat, and corn—are the major source of calories in the human diet throughout the world, both through direct consumption or by providing animal feed. In addition, corn is a significant source of raw materials for some segments of the chemical industry. Like other seeds of flowering plants, grain contains both the embryo and endosperm . The diploid embryo, often called the germ, contains the tissues that develop into the new individual after germination. The triploid endosperm is a rich nutritive tissue formed by the fusion of a second sperm and the two nuclei of the central cell in the embryo sac. Surrounding both endosperm and embryo is the protein - and oil-rich aleurone layer. This layer plus several thin outer coverings and the remains of the seed coat make up the bran. Rice ( Oryza sativa ) is grown throughout the world, but principally in the countries of Asia, where it forms the basis of the diet. Most rice is grown under flooded conditions, with fields drained two to three weeks before harvest. Removal of the hull (remnant floral parts) leaves brown rice. Further milling removes the bran and embryo to give white rice, by far the most popular form of rice. White rice is high in carbohydrates but low in protein or vitamins. Both traditional breeding and genetic engineering have been used to improve the qualities of rice. In the 1960s, shorter semidwarf varieties were bred. This allowed farmers to increase yields with fertilizers without having the long thin stems of full-height rice fall over before harvest. This development was a major part of the "green revolution" in the 1960s, in which grain yields kept pace with a skyrocketing world population, preventing widespread famine. More recently, genetic engineering techniques have been used to introduce a gene for a precursor of vitamin A, lacking in white rice. This so-called "golden rice" may help prevent blindness due to vitamin deficiencies, although the quantity of vitamin A available from the rice alone is insufficient by itself for this purpose. A wheat harvest in Polouse Valley, Washington. Wheat is the top food crop consumed by humans. Wheat ( Triticum sativum ) is the top food crop consumed directly by humans. Wheat consumption is supplementing or even replacing rice and corn consumption for many people in developing countries. Wheat is grown as a cool-weather annual, with some varieties even requiring a cold period to produce grain. Wheat is less profitable on a per-acre basis than other grains, but requires comparatively little labor and fewer inputs of fertilizer and pesticide. 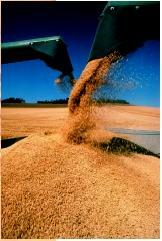 Wheat is milled to remove the hull to give "whole wheat," which can be ground into flour. Removal of the germ and bran before grinding gives white flour. Wheat is unique among the major grains in having a high level of the protein gluten in the endosperm. The elastic gluten protein allows dough to stretch. As yeasts added to dough release gas, the gluten expands, trapping the gas bubbles and allowing the bread to rise. Corn or maize ( Zea mays ) is a native of the New World and is grown primarily in South, Central, and North America. It still provides the major source of calories for most people south of the United States. Ancient corn was similar to modern popcorn, with a hard seed coat that trapped heated steam until the coat burst suddenly, exposing the puffy white endosperm. Traditionally, corn has been dried and ground into meal, using the entire kernel. The meal is then used for tortillas, tamales, and other foods. The entire kernel of sweet corn is also consumed, but the harvest occurs before seed maturity and before the sugars in the endosperm have been converted to starches. Removal of the seed coat leaves primarily endosperm, which is boiled to make grits, or rolled and baked to make corn flakes. Corn is a major feed for livestock, and provides the starting materials for a number of chemical products, including a variety of alcohols, acetone, polyurethane, and acetic acid. Several other grains are consumed in small quantities. The handful of species of millet are consumed mainly in Africa and Asia, with U.S. use primarily for birdseed. Rye ( Secale cereale ) is used in rye breads mainly in temperate areas in the Northern Hemisphere, and oats ( Avena sativa ) are grown for breads, breakfast cereals, and animal feed in these same regions. Barley ( Hordeum vulgare ) provides the source of carbohydrate for fermentation in beer. Leonard, Warren H., and John H. Martin. Cereal Crops. New York: Macmillan, 1963.